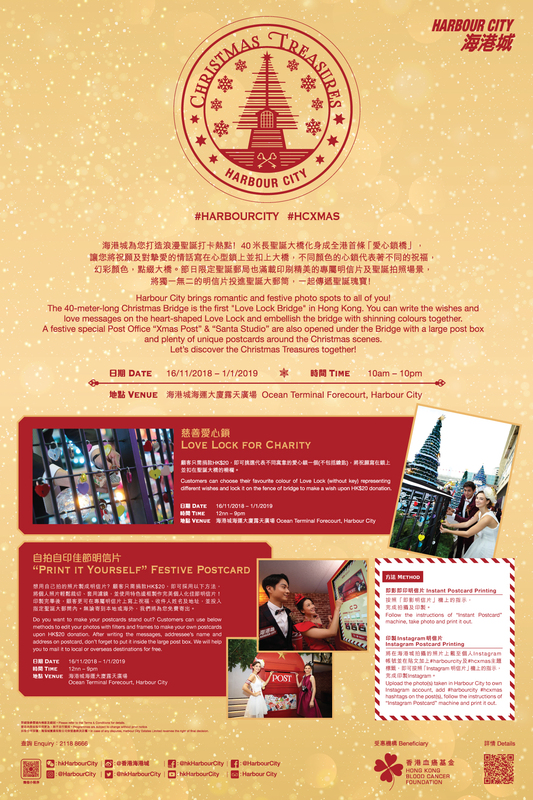 Harbour City is a “treasure city” filled with Christmas memories. Every Christmas, everyone will come to “treasure hunt” and feel the unique festive atmosphere here. 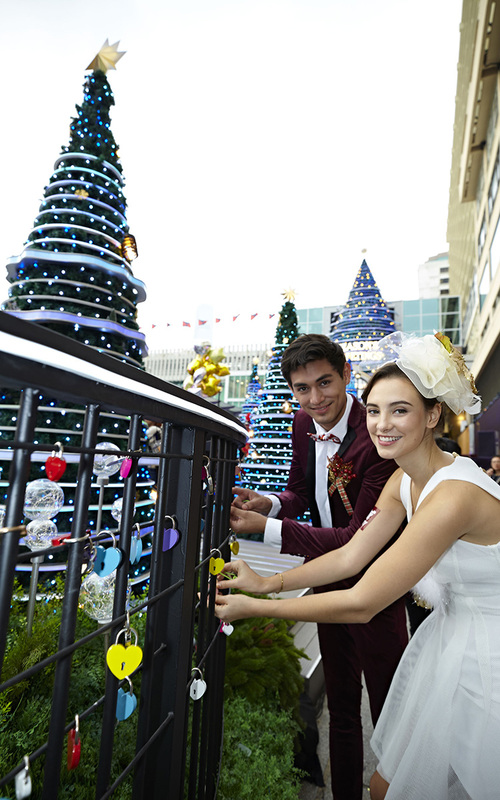 Harbour City brings romantic and festive photo spots to all of you! The 40-meter-long Christmas Bridge is the first “Love Lock Bridge” in Hong Kong. 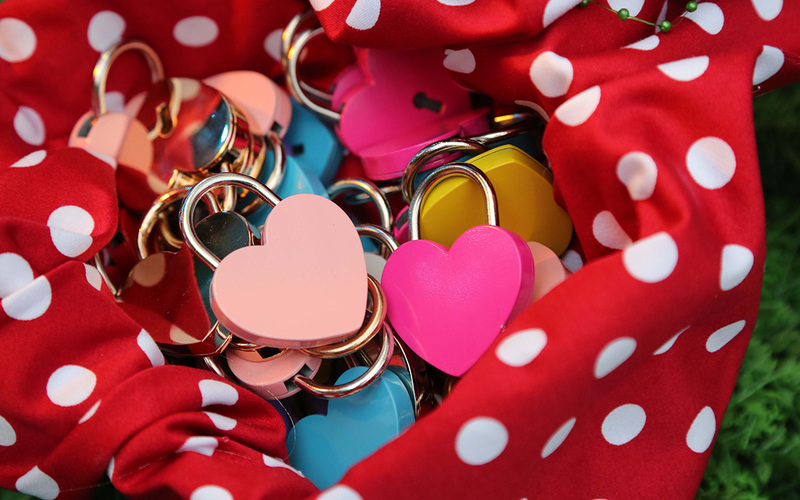 You can write the wishes and love messages on the heart-shaped Love Lock and embellish the bridge with shining colors together. A festive special Post Office “Xmas Post” & “Santa Studio” are also opened under the Bridge with a large post box and plenty of unique postcards around the Christmas scenes. 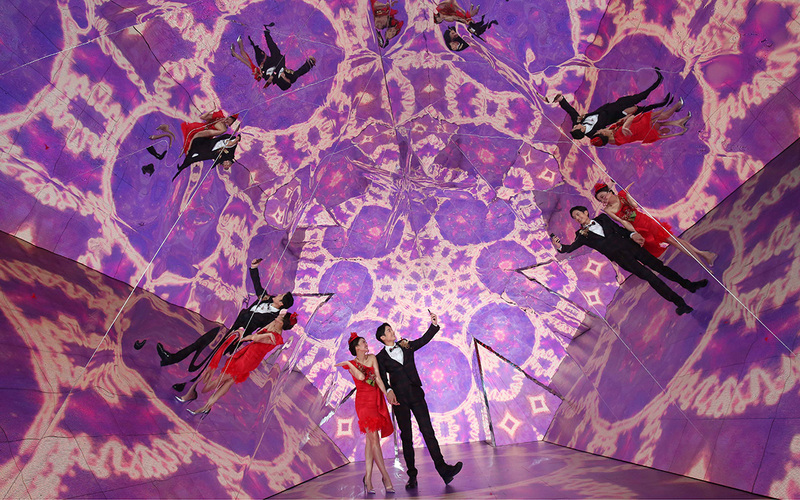 Last but not least, you can check out the world’s largest video kaleidoscope behind the Christmas tree. This Christmas, Harbour City brings you an unprecedented “secret garden” you must visit this year – the world’s largest video kaleidoscope. 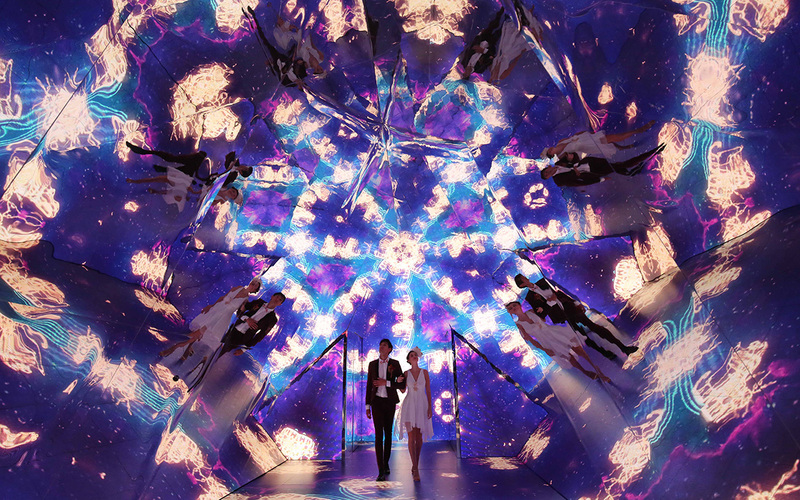 The 16 meters long, 4.5 meters high and 4.5 meters wide triangle mirror kaleidoscope is the largest one in the world. 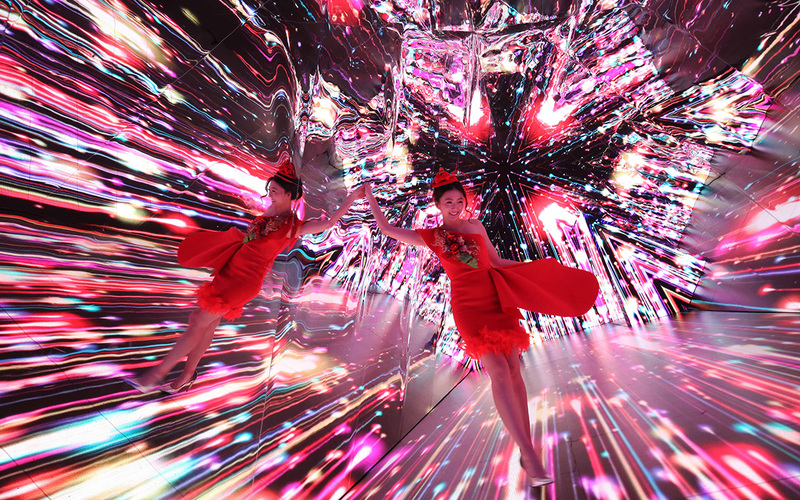 By walking through the kaleidoscope, you are entering a surreal world with dynamic Christmas themed scenery such as snowflakes, Christmas tree, stars and rainbow tunnel which are refracted through the triangular mirror and LED screen walls. Simply make donation to “The Hong Kong Blood Cancer Foundation”, you can visit this “selfie” and video friendly photo spot. 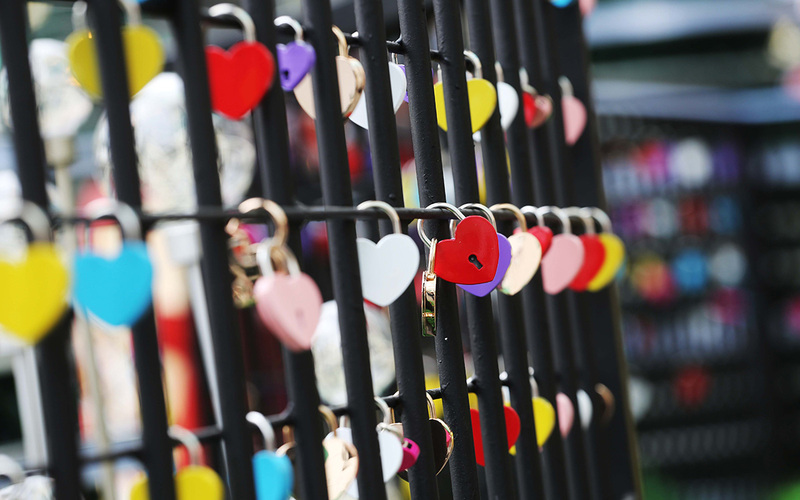 Customers can choose their favorite color of Love Lock (without key) representing different wishes and lock it on the bridge fence to make a wish upon HK$20 donation. Do you want to make your postcards stand out? Customers can use below methods to edit your photos with filters and frames to make your own postcards upon HK$20 donation. After writing the messages, addressee’s name and address on postcard, don’t forget to put it inside the large post box. We will help you to mail it to local or overseas destinations for free. 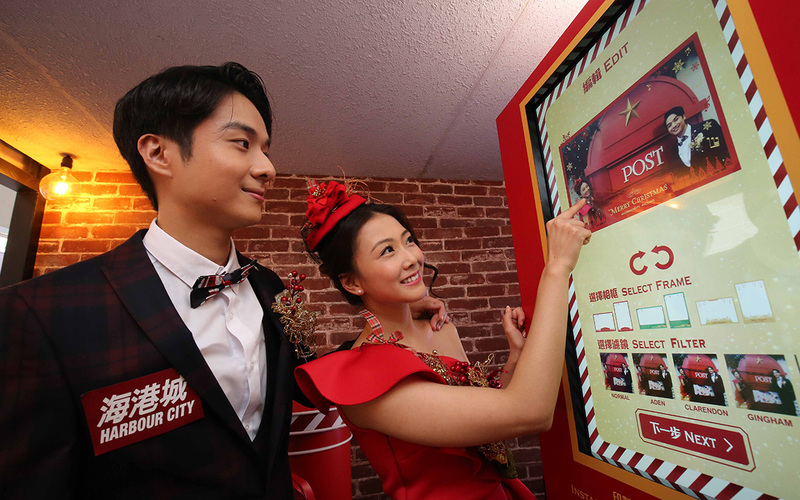 Instant Postcard Printing: Follow the instructions of “Instant Postcard” machine, take photo and print it out. No Christmas experience can be complete without getting up close and personal with Santa Claus. Simply make donation and you can get the chance to meet and greet him in front of Christmas Bridge and giant Christmas tree. Each time will entitle you to an instant photo with Santa! 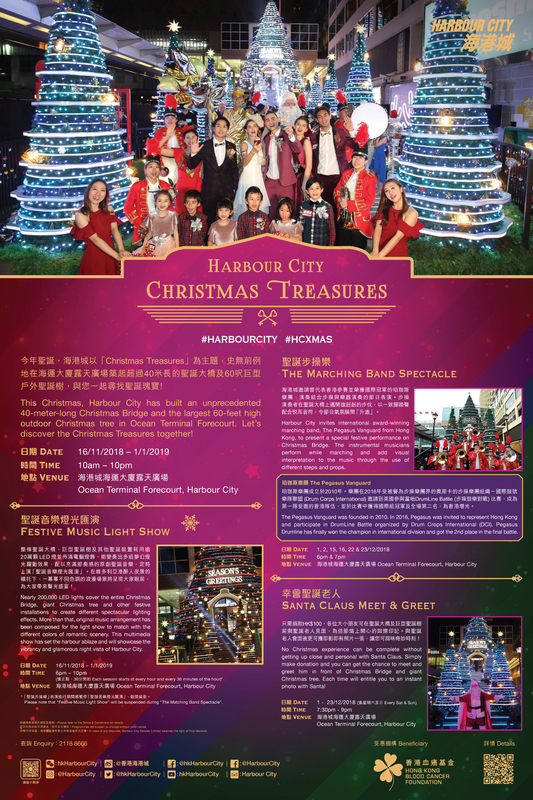 Harbour City invites international award-winning marching band, The Pegasus Vanguard from Hong Kong, to present a special festive performance on Christmas Bridge. The instrumental musicians perform while marching and add visual interpretation to the music through the use of different steps and props.